Not to be confused with Cold wave. A cold front is the leading edge of a cooler mass of air, replacing at ground level a warmer mass of air, which lies within a fairly sharp surface trough of low pressure. It forms in the wake of an extratropical cyclone, at the leading edge of its cold air advection pattern, which is also known as the cyclone's dry conveyor belt circulation. Temperature differences across the boundary can exceed 30 °C (54 °F) from one side to the other. When enough moisture is present, rain can occur along the boundary. If there is significant instability along the boundary, a narrow line of thunderstorms can form along the frontal zone. If instability is less, a broad shield of rain can move in behind the front, which increases the temperature difference across the boundary. Cold fronts are stronger in the fall and spring transition seasons and weakest during the summer. Clouds* Often preceded by cirrus, cirrostratus then altostratus like a warm front (but usually with smaller amounts of these clouds). Areas of cirrocumulus and altocumulus within cirrostratus and altostratus more commonly seen than at a warm front. Larger cumulus clouds under the higher cloud types than at a warm front, where stratocumulus and cumulus humilis usually occur. Some of these cumulus clouds may produce showers ahead of the front. Cumulonimbus and cumulus congestus producing frequent showers, with a sheet of upper altostratus, through which the sun can sometimes be seen. Less commonly nimbostratus occurs with continuous rain. Patchy altocumulus or stratocumulus and higher cirrus clouds along with fast moving stratus fractus then eventually scattered cumulus and sometimes cumulonimbus. *provided there is sufficient moisture. If the cold front is highly unstable, cumulonimbus clouds producing thunderstorms commonly form along the front. Anvil cirrus clouds may spread a considerable distance downwind from the thunderstorms. The other cloud types associated with a cold front depend on atmospheric conditions such as air mass stability and wind shear. As the front approaches, middle-étage gives way to altostratus and low-level stratocumulus with intermittent light precipitation if the warm airmass being displaced by the cold front is mostly stable. With significant airmass instability, vertically developed cumulus or cumulonimbus with showers and thunderstorms will form along the front. After the passage of the cold front, the sky usually clears as high pressure builds in behind the system, although significant amounts of cumulus or stratocumulus, often in the form of long bands called cloud streets may persist if the air mass behind the front remains humid. Small and unchanging amounts of cumulus or cirrus clouds in an otherwise clear sky are usually indications of continuing fair weather as long as the barometric pressure remains comparatively high. A cold front as it appeared on the National Weather Service Wichita, Kansas WSR-88D on April 3, 2011. The thin blue line labeled "cold front" is the front, with severe thunderstorms seen developing behind the front, which is moving towards the bottom right. A cold front commonly brings a narrow band of precipitation that follows along the leading edge of the cold front. These bands of precipitation are often very strong,  and can bring severe thunderstorms, hailstorms,  snow squalls,  and/or tornadoes. In the spring, these cold fronts can be very strong, and can bring strong winds when the pressure gradient is higher than normal. During the winter months, cold fronts sometimes come through an area with little or no precipitation. Wider rain bands can occur behind cold fronts which tend to have more stratiform, and less convective, precipitation. These rainstorms sometimes bring flooding, and can move very slowly when the storm steering it is strong and embedded within a meridional flow pattern (with more pole to equator motion rather than west to east motion). In the winter, cold fronts can bring cold spells, and occasionally snow. In the spring or summer in temperate latitudes, hail may occasionally fall along with the rain. If moisture is not sufficient, such as when a system has previously moved across a mountain barrier, cold fronts can pass without cloudiness. Frontogenesis is the process of creating or steepening the temperature gradient of a front. During this process the atmosphere reacts in an attempt to restore balance, the consequence is a circular motion along the front where air is being lifted up, along the cold front and dropping downward, behind the frontal boundary. This is the actual force of upward motion along a front that is responsible for clouds and precipitation. Cold fronts are the leading edge of cooler air masses, hence the name "cold front". They have stronger temperature changes during the fall (autumn) and spring and during the middle of winter. Temperature changes associated with cold fronts can be as much as 50 °F (30 °C). When cold fronts come through, there is usually a quick, yet strong gust of wind, that shows that the cold front is passing. In surface weather observations, a remark known as FROPA is coded when this occurs. The effects from a cold front can last from hours to days. The air behind the front is cooler than the air it is replacing and the warm air is forced to rise, so it cools. As the cooler air cannot hold as much moisture as warm air, clouds form and rain occurs. 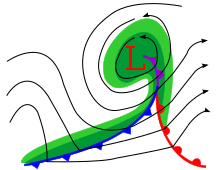 Occluded cyclone example. The triple point is the intersection of the cold, warm, and occluded fronts. Cold fronts form when a cooler air mass moves into an area of warmer air in the wake of a developing extratropical cyclone. The warmer air interacts with the cooler air mass along the boundary, and usually produces precipitation. Cold fronts often follow a warm front or squall line. Very commonly, cold fronts have a warm front ahead but with a perpendicular orientation. In areas where cold fronts catch up to the warm front, the occluded front develops. Occluded fronts have an area of warm air aloft. When such a feature forms poleward of an extratropical cyclone, it is known as a trowal, which is short for TRough Of Warm Air aLoft. A cold front is considered a warm front if it begins to retreat ahead of the next extratropical cyclone along the frontal boundary, and called a stationary front if it stalls. ^ "Cold December: 2013". www.climate.umn.edu. Retrieved 20 January 2018. ^ David Roth (2006-12-14). "Unified Surface Analysis Manual" (PDF). Hydrometeorological Prediction Center. Retrieved 2012-01-09. ^ Paul M. Markowski; Yvette P. Richardson (2011-09-20). Mesoscale Meteorology in Midlatitudes. John Wiley and Sons. p. 120. ISBN 978-1-119-96667-8. Retrieved 2012-01-09. ^ a b Donald, Ahrens, C. (2007). Meteorology today : an introduction to weather, climate, and the environment (8th ed.). Belmont, Calif.: Thomson/Brooks/Cole. pp. 298–300. ISBN 978-0495011620. OCLC 66911677. ^ Lee M. Grenci; Jon M. Nese (2001). A World of Weather: Fundamentals of Meteorology: A Text / Laboratory Manual (3rd ed.). Kendall/Hunt Publishing Company. pp. 207–212. ISBN 978-0-7872-7716-1. OCLC 51160155. ^ a b Holton, James R. (2004). An Introduction to Dynamic Meteorology. Academic Press. p. 277. ISBN 978-0-12-354015-7. ^ Weston, K. J. (1980). "An observational study of convective cloud streets". Tellus. 32 (5): 433–438. Bibcode: 1980TellA..32..433W. doi: 10.1111/j.2153-3490.1980.tb00970.x. ^ Glossary of Meteorology (2009). Prefrontal squall line. Retrieved on 2008-12-24. ^ Schemm, S.; L. Nisi, A. Martinov; D. Leuenberg & O. Martius (2016). "On the link between cold fronts and hail in Switzerland". Atmospheric Science Letters. 17 (5): 315–325. doi: 10.1002/asl.660. ^ K. A. Browning and Robert J. Gurney (1999). Global Energy and Water Cycles. Retrieved on 2008-12-26. ^ Carlson, Toby N. (1991). Mid-latitude Weather Systems. HarperCollins Academic. p. 435. ISBN 978-0-04-551115-0. ^ Nav Canada (January 2005). Aviation Weather Services Guide. p. 36. ^ St. Louis University (2003-08-04). "What is a TROWAL? via the Internet Wayback Machine". Archived from the original on 2006-09-16. Retrieved 2006-11-02.